Compared to the famous trio of Rome, Florence and Venice, the city of Milan is an unsung destination, but with its awe inspiring cathedral, world-class shopping and a bustling confident vibe, this northern Italian city will surprise you. Spend one day in Milan and discover it’s appeal for yourself. Apparently there are many, thanks to Dan Brown and the Da Vinci Code. The bored ticket agent shrugs and turns to the next hapless couple in line. 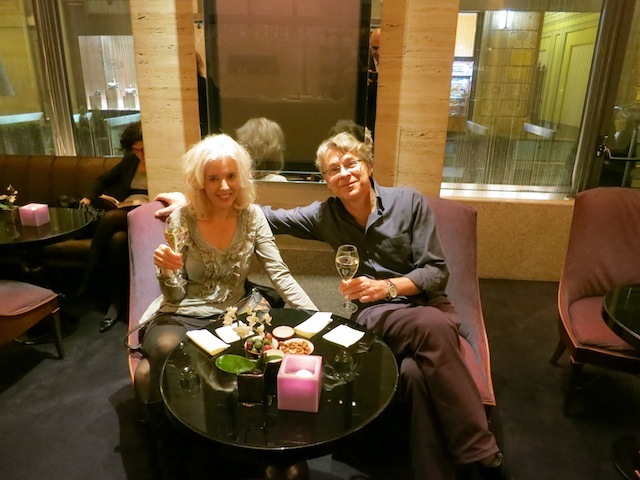 I looked at Mark, my husband of two weeks and said, “Now what?” No way was I giving up. We’d been through this before. In Florence, when the lineup for the Uffizi Gallery had been horrendous, rather than wasting an entire morning inching forward in a line-with-no-end, we’d bought a last minute ticket for an art tour from a hawker, and not only saw the Birth of Venus by Sandro Botticelli but had an excellent tour as well. All for about $40 a piece. Since this was our honeymoon and supposed to be perfect, full of luxury travel, divine hotels and happiness, of course we had to find a way to see The Last Supper, one of the most famous paintings in the world and probably Milan’s top attraction. Nothing goes wrong on a honeymoon in Europe, right? We went outside, waited in the little square outside the Santa Maria delle Grazie with expectant looks on our faces and … nothing. Not a hawker. Not a scalper. Not a black market ticket to be found. Only a few disconcerted passersby who couldn’t understand why I was eyeing them so eagerly. The Last Supper was the one tourist sight I’d really wanted to see, but I finally had to admit defeat. Oh, well, I thought, launching into plan B. All the more time for shopping. After all, Milan is the fashion capital of the world. There must be a designer sweater with my name on it somewhere. And here’s the thing about Milan. It’s more than just fashion, but it gets a bum rap, not being part of the great Venice-Florence-Rome tourism triumvirate. 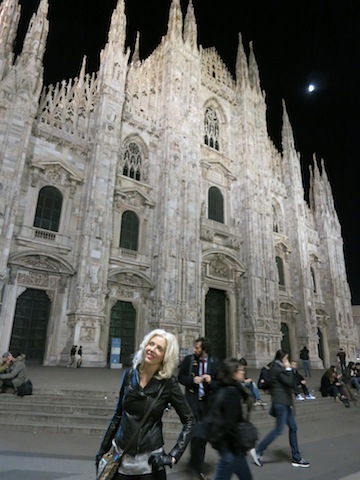 However, if you love a city that screams elegance, grit and power all at once (and as a luxury travel blogger believe me, I do), skipping Milan is a mistake. Things happen in Milan. 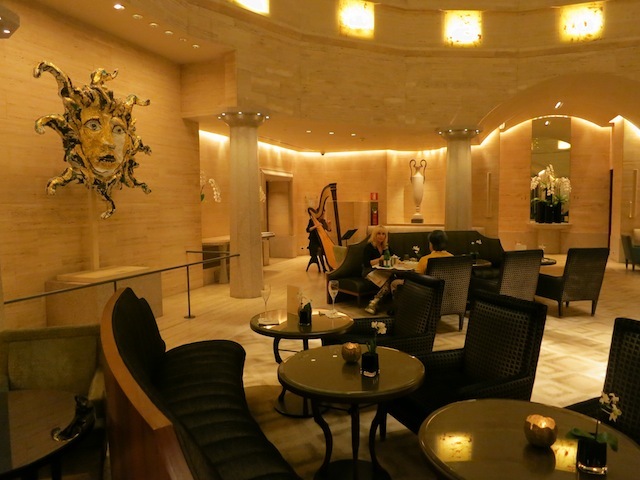 Even if you’re not staying at the Park Hyatt, it’s worth stopping in. The stone exterior dates back to 1870, and looks very old-world grand, while the interior, designed by Ed Tuttle, centres around a huge glass dome and is filled with art and light. What I love about the hotel is that it feels like a hub of the city and not just a tourist depot. Breakfast in the lounge was like eavesdropping on the movers and shakers of the city, but because it’s Milan they’re all stylish and handsome. Beside us, two artsy Italian young men were having a power breakfast with two fashionista American women. I was guessing artists and their female art dealers from New York, but Mark, who knows how much I love gossip whether I know the players or not, told me he overheard something about IT. Steps away from the Park Hyatt Milan (in fact you’re practically in it when you step out the door) is the glorious Galleria Vittorio Emanuele II completed in 1877. 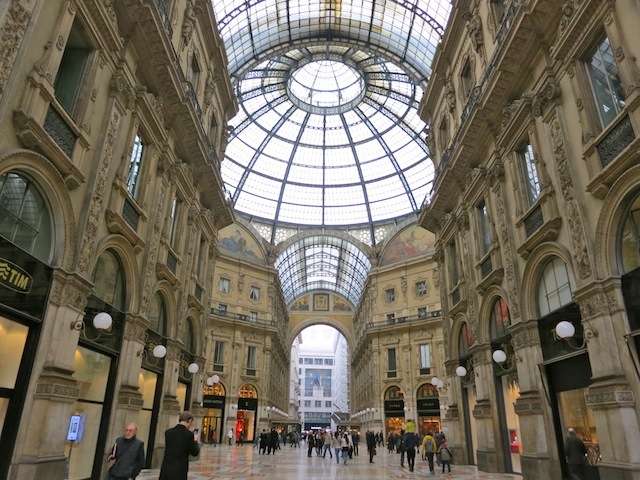 What is the Galleria Vittorio Emanuele, you ask? It’s a covered shopping mall, if you can imagine a mall that is part Saks 5th Avenue and part Vatican, with a lot of glass, steel and nice restaurants thrown in. 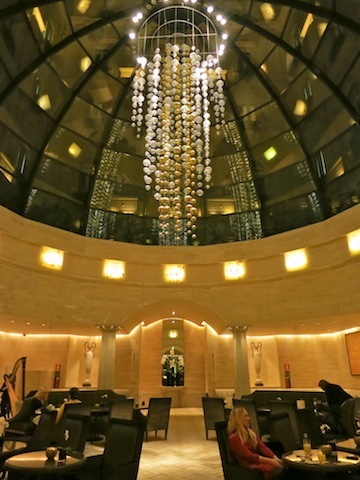 This is where you’ll find big name designers like Prada and Louis Vuitton and plenty of cafes to rest your weary feet. 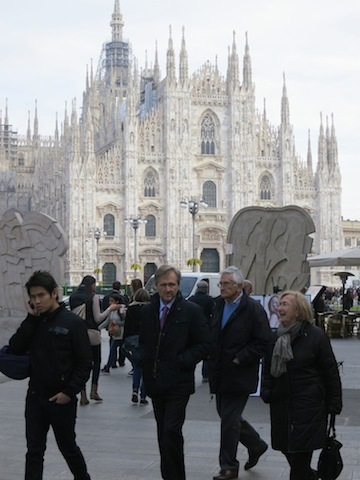 But don’t spend too much energy shopping here, because the most famous shopping streets in Milan are yet to come. 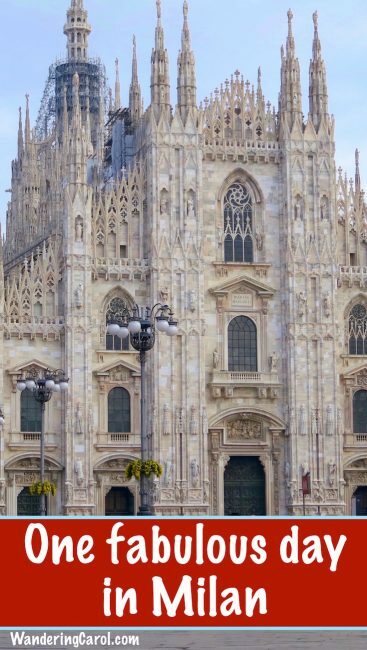 The Duomo is impossible to miss – it stands just outside the Galleria Vittorio Emanuele II. It’s an astonishing gothic confection of white pink marble that dominates Cathedral Square. Literally, it will take your breath away so just stand there, gasp and enjoy that now-I-remember-why-I-love-travelling thrill. A few facts, because sightseeing isn’t all thrills and chills. Details are important, too. Construction on the Duomo started in 1391 and continued for centuries. There are 3,500 statues, 150 spires and 52 pillars, one for week day of the year. Okay! Let’s move on. Backtrack through the Galleria Vittorio Emanuele. On the other side is the beautiful Teatro alla Scala on the Piazza della Scala, one of the most famous opera houses in the world. It was grand when it opened in 1778 and it’s still grand today, and if you manage to get tickets to an opera make sure you go glam – if our experience at La Fenice Opera House in Venice is anything to go by, this is a place for furs, bling and Jimmy Choos. Now it’s on to Via Montenapoleone and Via della Spiga and the high-end shopping area known as the Rectangle of Gold (gold-plated credit cards, maybe). This shopping adventure, if you’re on your honeymoon, may make your new spouse wonder if he (or she) has made a grave mistake and is now heading for bankcruptcy. He (or she) may even be thankful you have only one day in Milan. It will also make him (or her) think you are going to miss your train, or at least this was the situation in our case, because ten minutes before we were supposed to be back at the hotel to get a taxi to the train station, I found a cashmere store. In my defence, let me just say that I wear that beige cashmere sweater with the faint silver trim and matching scarf ALL THE TIME, so really, it was a sound investment. And we made it to the station before our train left anyway, so I was using my time wisely. Plus I learned something about my new husband – he can really keep his temper under control no matter what he’s thinking underneath. 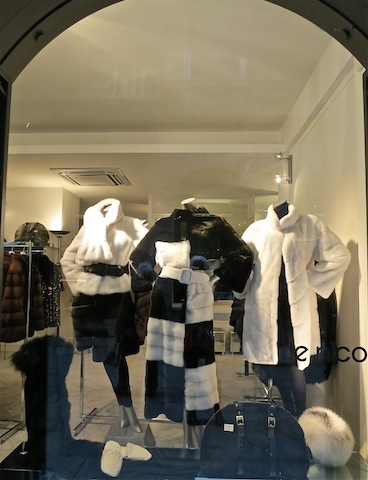 My picks for shopping are Twin-Set by Simona Barbieri on Via Manzoni (because my very untraditional wedding dress was Twin-Set), and the cashmere store Enzo Mantovani on Corso Matteotti. The prices aren’t Versace, yet both are Italian and therefore good places for souvenirs. 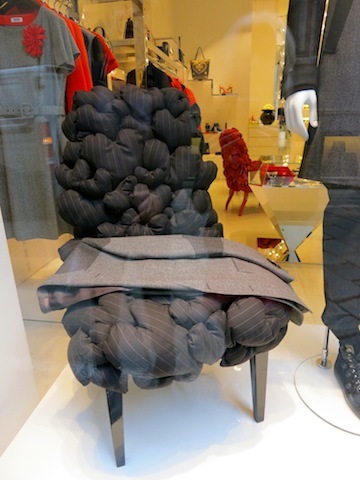 I was also scouring the area for Elisa Cavaletti, my current favourite Italian designer, but had no success, even after I made Mark take a taxi out into the suburbs to look for her store. Tip: don’t do that if you have only one day in Milan. After, during and before all this shopping you’ll want to stop for regular infusions of espresso or macchiato, even if just to rest your feet. If the sun is shining sit outside with a view of the Duomo as we did, or pick an atmospheric cafe inside the Galleria Vittoria Emanuele and watch the super-models-in-training pass by. 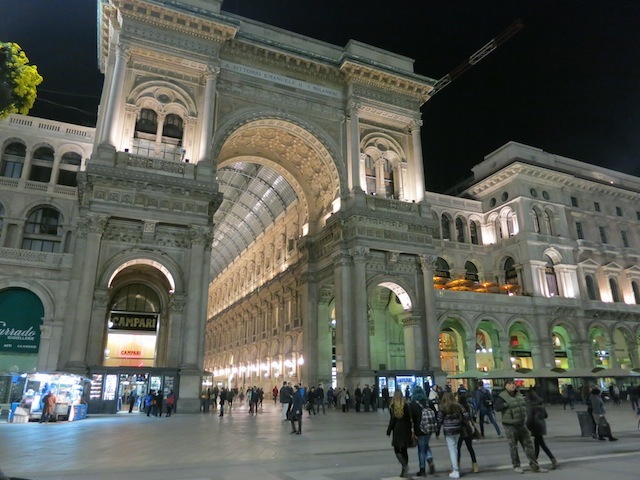 Or, if you’re really tired as we were, settle in for dinner and feast on Osso Bucco, a traditional dish of Milan, then walk around at night and sightsee all over again. Book in advance to see the Last Supper here. We travelled on a Eurail pass with Eurail Group. Milan is about 2.5 hours from Venice. Wow, that Galleria Vittorio Emanuele is really stunning. 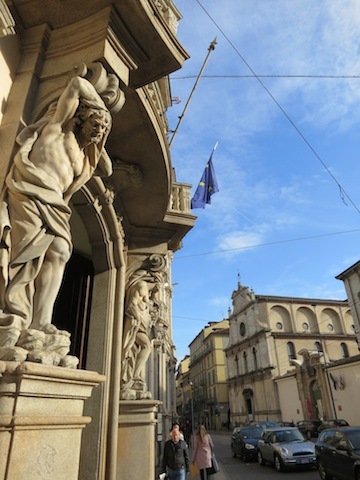 Strangely, I’ve often heard a person should skip Milan if time is tight on a trip to Europe but based on your post, it really sounds worth spending time in -The Last Supper aside. Oh, thanks for the great tips, Paolo. Cool! You’ve covered the basics about Milan. You’re right on spot : “In Milan there’s more than meet the eyes”. Anyway, for ths shopping addicts don’t forget to go to Corso Buenos Aires: the longest shopping street in Europe (3 miles IIRC), you’ll sure find something to buy and you won’t get sticker shock. For the museum inclined go to Via Manzoni to Museum “Poldi Pezzoli”, a private museum where you won’t have problem getting in.